Hand-crafted and designed by Kenda Kistenmacher. Each piece is hand-forged with delicate craftsmanship. Kenda designs classic pieces that integrate a funky twist, yet they are timeless enough to wear at any age. Her goal is simple: surpass trends and create functional, lightweight jewelry for women to wear for any occasion. Kenda meticulously selects the finest gemstones and precious metals, which are sourced responsibly and are combined artfully. Sterling silver and 14K gold-filled pieces define the brand. Handforged and made in the USA. 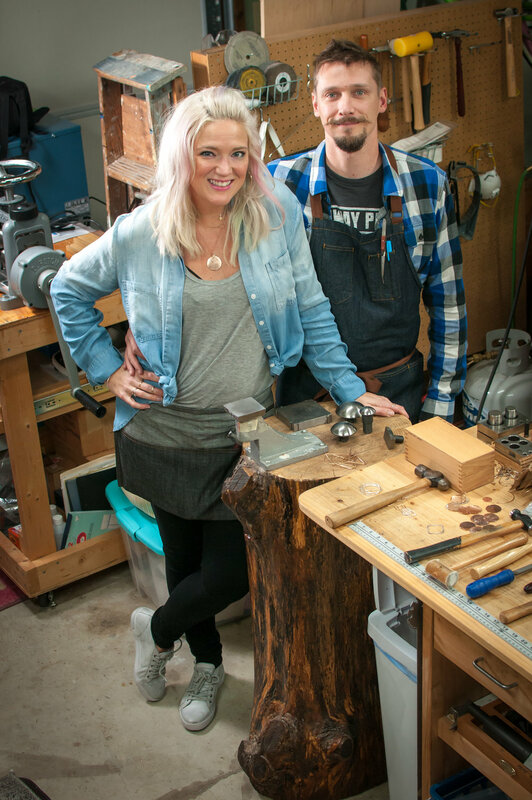 Recently Kenda's husband Marty Markel joined the Kenda Kist Team to add a new element to the line, stone setting and custom jewelry. Marty is a highly skilled Gold Smith with over 12 years of experience on the bench and can create pieces in Gold, Silver, and Platinum using any gemstone you desire. We genuinely value your business and hope you enjoy your unique, hand-crafted design from Kenda Kist.